Tinolius is a genus of five striking moths in the family Erebidae (Noctuoidea), sometimes called Owlet moths. 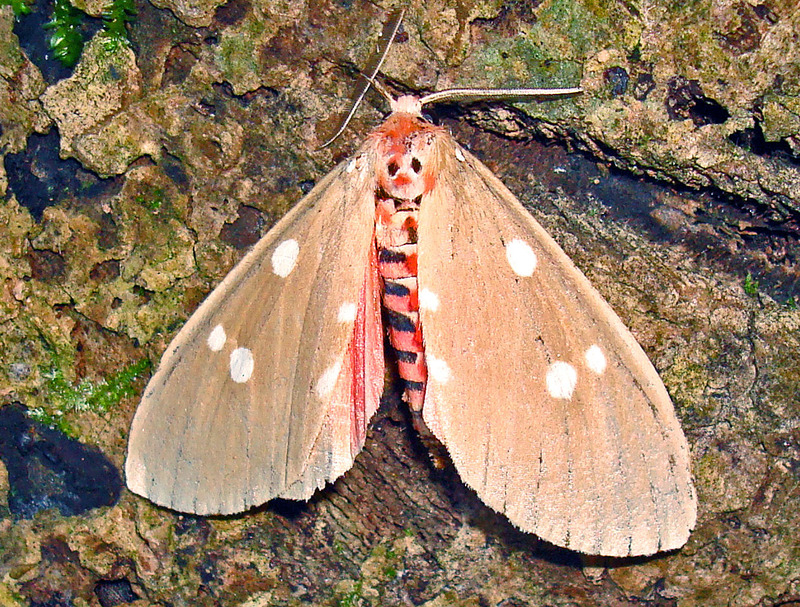 The forewings are buff coloured with different numbers of white spots; the abdomen is pale red or yellow with lateral black bars on each segment. The male antennae are strongly bipectinate – meaning that they have two margins – toothed like a comb – a bit like a feather (below). This species has one less white spot than the one above, but I have not seen able to name it. 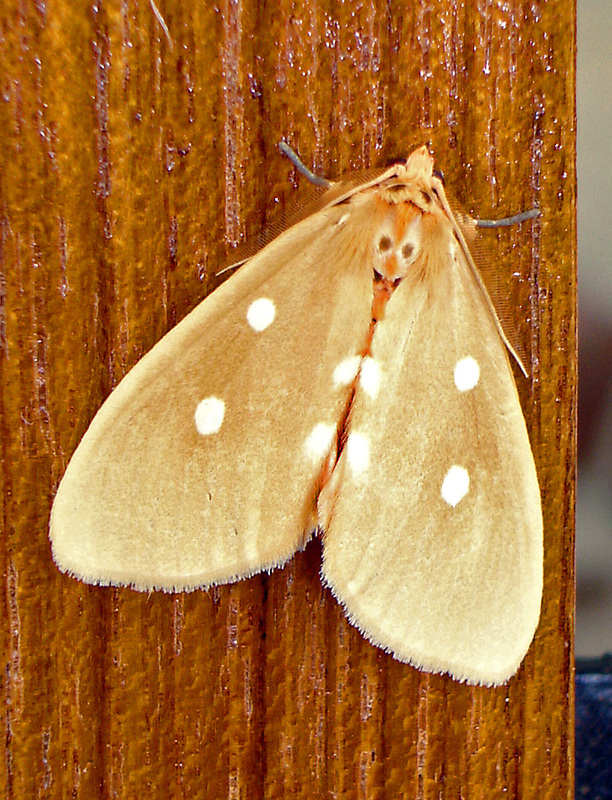 The larvae of these moths are described as being ‘ophiusine’ semi-loopers (1). They have very long and fine setae, some of which are elongated and flattened at their ends into black blades. They really are extraordinary looking caterpillars. Quite what the function of the paddle-like structures is, other than defence, I don’t know. There is very little in the on-line literature on these remarkable insects. All of these photographs were taken in northern Thailand, at Doi Chiang Dao. Zahiri, Reza, et al. “Molecular phylogenetics of Erebidae (Lepidoptera, Noctuoidea).” Systematic Entomology 37.1 (2012): 102-124. Next Next post: Peck me here! Butterfly predation. Ray, looking at your info about Tinolius eburneigutta (or sp) there seems to be not literature regarding the caterpillars and their “wings”. The individuals I spotted in Ubud Bali ALL looked like, from a distance, like a wasp or a pair of wasps and struck me as an example of Batesian mimicry. I’ve loaded images including a photo of a wasp found in the same area on the INaturalist web site. I would be interested in your comments both on spewcies and the Batesian mimicry idea? Yes it is remarkably wasp like! Yellow and black are classic aposematic colours of course, which warn of danger. If the caterpillars are toxic, or distasteful, then it is not Batesian mimicry. That’s where an edible insect pretends to look like a toxic one; gaining the advantage of protection without having to invest resources in making its own toxins. Where two unpalatable species look very much like each other, its called Müllerian mimicry. 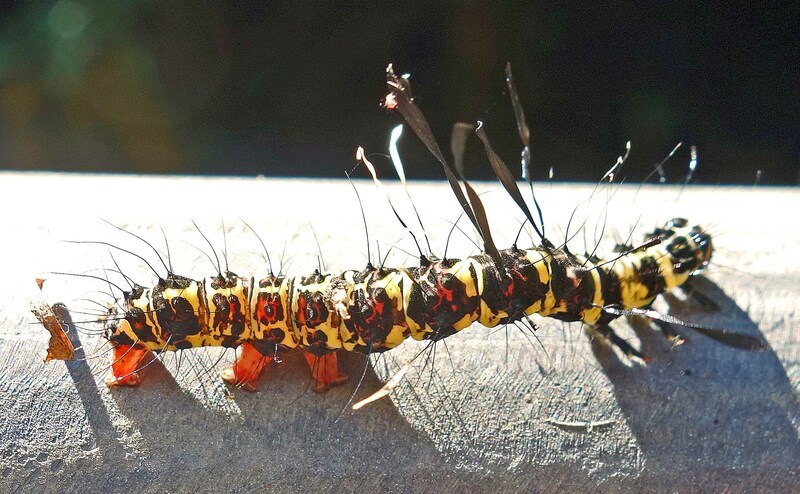 But for these caterpillars to be true Müllerian mimics, they need to share the same habitat and occasionally occur in the same places as their so-called ‘models’ (wasps? ), I think. Otherwise, the caterpillar is just relying on general warning colouration. But given how much it actually looks like a wasp, I’m inclined to think it is a mimic, and I bet it is distasteful – did you taste one?! – so probably a Müllerian mimic.😊 If it could make a buzzing noise – some caterpillars do emit sounds – that would clinch it!